You may also wnat to search for Kyohachi-Ryu Kenjutsu, I have been taught it is the decendant of the Yagyu Muneyori style. Munenori was the son of Muneyoshi. Is this an academic interest or are you interested in training in the style? There is a Yagyu Shinkage Ryu dojo in the Tampa area. I bought the "兵法家伝書", "the life giving sword", in english, on amazon.com, It contains images and explanation on various techniques, and a lot more on history etcetera. 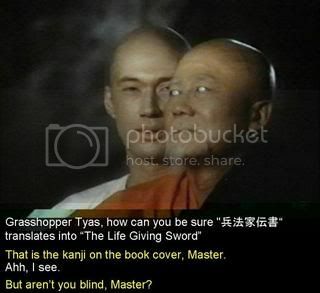 How exactly does "兵法家伝書" translate as "the life giving sword"?? I know you're being funny and all, OB, but I'm sort of serious. I read that title as something approximating "Book of the traditions of the house of military law" or something maybe slightly less awkward if I thought harder about it. Nowhere in there are "sword", "life", or "giving". I realize many martial artists are trying to sell a philosophical mumbo jumbo "lifestyle", but come on--translate it how it reads, for crying out loud. Clowning aside, when I looked up the kanji and tried to translate it, I came up with something similar to what you had. However, the truth is that this is the kanji below the full title of the book "The Life Giving Sword: Secret Teachings from the House of the Shogun". Hence, the English subtitle is more in line with the kanji. readiness to fight, rather than during the fight. His mastery of restraint and diplomacy made him a trusted political and military advisor to the shoguns. This book is a look into a master swordsman's thoughts on nonattachment and even non-violence." I've seen this book before, but have put off buying it because it looks like it rambles too much for my liking about the exoteric things in life. Basically, my understanding is that the book is a compilation of letters between the real Takuan and Munenori. William Scott Wilson translated it and he is fairly well respected. Indeed the title is a pretty free translation, given to the book by the translator. The subtitle is indeed a more accurate translation of the original book title. Basically, my understanding is that the book is a compilation of letters between the real Takuan and Munenori. The book isn't realy a compilation of the translated letters between Takuan and Munenori. It contains lots of information about the History of the shinkage ryu, about the lives of the first masters, and a bit about the techniques, the structure is a bit like the one musashi used in his "go-rin-no-sho", except for the use of the 5 elements. It does is true that there is a book which includes solely the translations of the letters between Takuan and Munenori, but that one is called "The unfettered Mind". Right, The Unfettered Mind is the collection of letters between Munenori and Takuan. Doh! Obenjo, if you want to read "兵法家伝書" by Munenori, you better off buying it in Japanese ( I think current jpn versions are complete). The english version is only about 1/4 of the real book. I don't know why it was never fully translated, but it's not the first time I see that. Taiheiki is an example. '兵法家伝書' translates into English roughly as "The family manual of military strategy". If you were to refer to say the Yagyu family in Japanese, you'd say Yagyu-ke (柳生家). The Kanji IE -ke/ka (家) means house when used on it's own. In conjunction with say a family name, it's referring to the family or household. Since the Heiho Kadensho is a manual of strategy specifically for Yagyu Shinkage-ryu kenjutsu system written by the Yagyu family, it's quite elementary. BTW, 活人剣・活人刀 Katsujinken/Katsuninto is "life giving sword". If you can read Japanese, one of the best versions of the Heiho Kadensho out there is the Watanabe Ichiro version by Iwanami publishing. Thanks for giving that info Steve. As oyu will find out I have been busy and barely have time to check threads, let alone reply to them. Just a little more necromancy -- hoping to liven this forum up! The best DVD out there is the that's part of the Nippon Budokan's "Nippon Kobudo Series", available here. This is really affordable, too! These DVDs go for $90-100 here in Japan. This DVD was filmed in the late 1970s, when the previous soke, Yagyu Nobuharu-sensei, was in his late 50s. There is another DVD recently put out by the Shunpukan, an offshoot of the mainline two generations back, but I haven't seen it, and can't vouch for the quality. I think it's only available in Japan. There are, of course, lots of clips of various embu by various lines on Youtube. Regarding the Heiho Kadensho -- this work is made up of three scrolls: Shinrikyo (the Shoe-Offering Bridge), Setsuninto (the Death-Dealing Sword), and Katsuninken (the Life-Giving Sword). Wilson chose this last for the overall title of his translation, probably because it looked better/catchier than "Family Book of the Martial Arts". While it is plagued by the usual problems of translating such a specialty work by a non-specialist, it's a highly-competent translation, and recommended. I missed this one by a little bit! I have been reading three books about/by Yagyu. The first is the Wilson translation and that's fine. I was wondering how many different writings about Yagyu are written that are actually attributed to him? I should not believe the copy I read on Amazon! In the first part of the Wilson translation we have as stated before. The Shoe Presenting Bridge, The Death Dealing Sword, the Life Giving Sword. Are these works the only ones he left behind? I read about other scrolls he wrote that were not meant to be shared. I have happened upon another book while purchasing this one. The Sword and the Mind translated by Sato Hiroaki. What I liked about this book is that Sato assumes much less in terms of understanding by the reader and thus it seems more reader friendly. The Wilson version has printed the scrolls(catalogues) too small(imho) in the back of the book while Sato has his printed in the middle and large enough to see. I must admit I do not read kanji and Sato is kind enough to explain details. I wanted to know if these two books are different versions of the same because of the catalogues that are common to both? The third book by D.E Tarver The Way of the Living Sword seems to be more cliff notes than anything else. Is this book just a hacked up version of The Life Giving Sword?" There are a number of Munenori's writings that survive. The most popular is "Heiho Kadensho", which is what Wilson, Sato, and Tarver all translated. This is the most accessible because of an edition published by Watanabe Ichiro through Iwanami Bunko (a paperback publishing house that specializes in various classics and educational texts). Heiho Kadensho is made up of three parts: Shinrikyu (the Shoe-Presenting Bridge), Setsuninto (The Death-Dealing Sword), and Katsuninken (The Life-Giving Sword). Part of the Katsuninken section is further divided and called Muto-no-Maki (Scroll of No-Sword). There are no illustrations in Heiho Kadensho, but Wilson and Sato include images from a scroll drawn by Munenori's father, Sekishusai, and given to Takeda Ujikatsu. No doubt they include them because they are included in the Iwanami Bunko edition put out by Watanabe. Sato's translation is more academic, while Wilson actually has experience in a classical martial art, so his translation has a little more "real world" perspective. However, both are imperfect. I don't know how much Tarver's translation can really be called a translation. It appears that he has more or less cribbed from other translations to create his own, and my impression is that he really doesn't know much beyond basic Japanese. Ironically, though, he cut out any and all technical discussion from the original, so his translation doesn't many of the mistakes of others. So, if you're looking for a full translation of Heiho Kadensho, I wouldn't recommend it, but if you just want to read the philosophical parts, it's not that bad. Tarver is a mainly a karate-ka of dubious distinction. In addition to Heiho Kadensho, Munenori also wrote the "Heiho Kiriai Kokoromochi no Koto", a work that's far more technical and less philosophical. There was also the "Gyoku-sei Shu" and "Shinkage-ryu Heiho En-no-Tachi Mokuroku no Hoka no Mono", works that he wrote for the 3rd Shogun Iemitsu. There's also the smaller, similar works that he wrote to others. Most (perhaps all?) of these were edited and published by Imamura Yoshio in the 70s (during the big Yagyu-boom of the time) in his two volume "Yagyu Shinkage-ryu Shiryo" (Historical Documents of Yagyu Shinkage-ryu), but those books are long out of print and are only available in libraries and old bookshops. They sell for exorbitant prices.